There is an abandoned Vehicle, White Toyota Sequdia, License Plate: NY50248ML https://311.boston.gov/reports/101002854262 Second notice. Please advice to BTD. 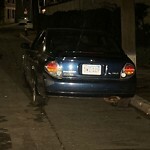 Blue Nissan Maxima plate 5wz129, has been parlen on the same plane for over 10 days. Driver's windows is rolled down or broken , flat tire. Additional Details/Comments: Constituen reports vehicle on street in area of address that is being stripped for parts. States there are no tires, no doors, no plates.